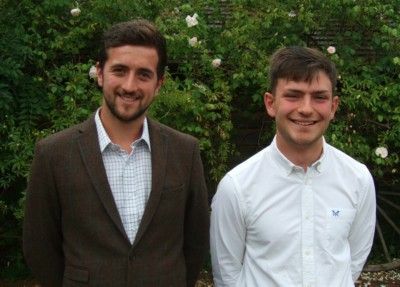 Cranleigh Rotary has been supporting the studies of Josh Redford and Alecco Galiotzakis, twoaspiring young farmers, who are students at Plumpton College, since 2014. During their three-year courses, each of them receives a grant of £250 per annum from the Club to assist with the cost of educational programmes and equipment, including personal safety equipment, laptops, books etc. Last summer, Josh and Alecco gave an illustrated presentation to the Club, showng what they had been involved with during their first year at college. This year, Josh was unfortunately unable to come along to speak to the Club members, but he sent his grateful thanks for all that we are doing. However, Alecco was able to cut short his crop harvesting for an evening and he gave us a fairly lighthearted account of his activities during his current gap year, during which he is gaining a wide range of practical farming experience. He was accompanied by Alec Clouting, an ex-Plumpton student who is currently a manager on a farm in Dunsfold and slowly building up his own flock of ewes. Photo caption: Alecco Galiotzakis (right), one of the farm students sponsored by Cranleigh Rotary, with Alec Clouting, during their visit to the Club.